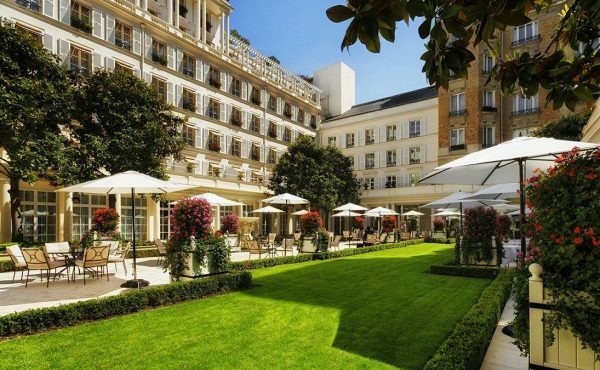 Hôtel Le Bristol Paris: a five star palace hotel that enchants with its warmth and its exquisite setting within one of Paris’ most beautiful and historic mansions. The hotel is located on the prestigious Rue du Faubourg Saint-Honoré in the 8th Arrondissement, at the heart of Paris’ fashion and arts district, where it has been welcoming its esteemed guests since 1925. Opening as a hotel during the Roaring Twenties means Le Bristol Paris has played host to many a glamorous icon including Marilyn Monroe, Charlie Chaplin, Grace Kelly and Rita Hayworth. The hotel is named as tribute to an eighteenth-century traveller famed for his love of comfort and his high standards concerning hotels, Bishop Frederick Hervey, 4th Earl of Bristol. 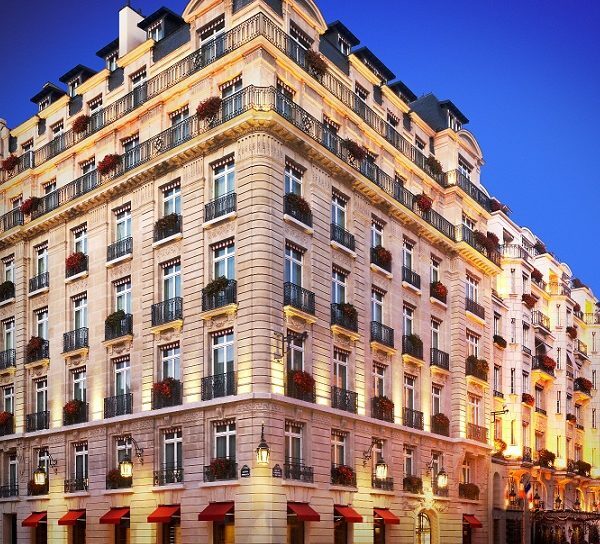 Le Bristol Paris was named the first French ‘palace hotel’ and is now a member of the exclusive Leading Hotels of the World and is part of the five star family-owned Oetker Collection, which includes Hotel du Cap-Eden-Roc and new addition Palais Namaskar in Marrakesh. 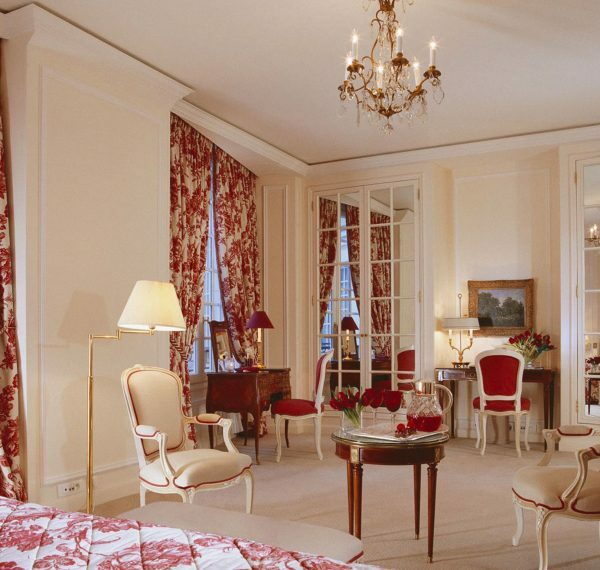 In 2007, the hotel ushered in a new era through the acquisition of the adjoining building allowed the hotel to become more prominent on the corner of avenue Matignon and Rue du Faubourg Saint-Honoré and in 2009 the splendours of this ‘new extension’ The Matignon Residence were unveiled with an additional twenty-one rooms and five suites. The hotel now boats 188 rooms and suites which are spacious and bright, decorated in classic eighteenth-century style paying homage to the history of the building. Rachel and I arrived at Le Bristol Paris after a short cab ride on a balmy summer day and we were immediately welcomed by the attentive, enthusiastic staff, who knew exactly who we were (our reputation had obviously preceded us). We were greeted warmly and checked-in by the delightful Eric Régnier, Front of House Manager, efficient and everything one would expect from such a hotel. 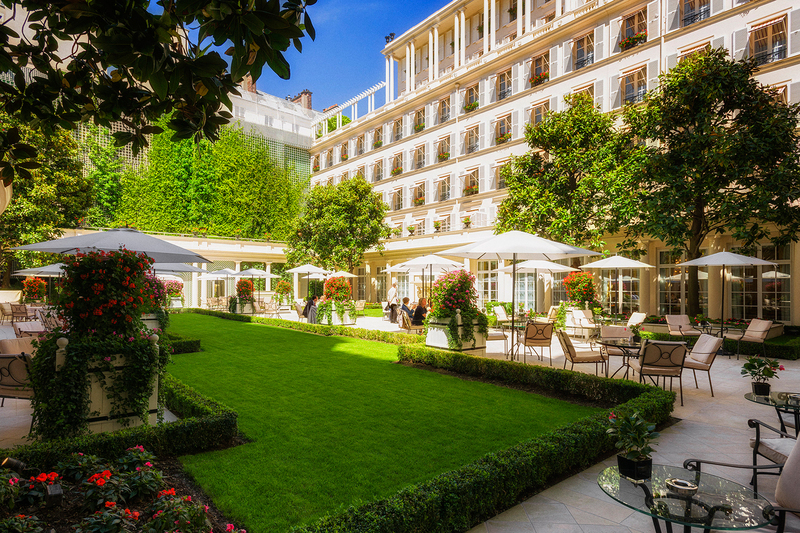 While waiting on our rooms to be ready, and luggage left with reception, Eric took us through the breathtaking interior of the ground floor, past Epicure and Le Bar out to the the sun soaked terrace garden of Le Jardin Francais. Rachel and I were transported to the south of France in an instant, walled on all sides by the hotel with trellises hosting an array of colour and scent glistening in the summer sun, this space is indeed enchanting, the perfect spot to enjoy a pot of tea while waiting on our rooms. After a refreshing pot of green tea served in dainty china bearing Le Bristol’s double unicorn coat of arms and a very informative chat with charming Kevin Chambenoit, Food and Beverage Director, Rachel and I were taken to rooms. Awaiting us was a wonderful surprise from the wonderful team of Le Bristol, a Junior Suite each located in the Haussmann-inspired Matignon Wing. Both classic with a modern finish, filled with Louis XV and Louis VXI style furniture, sumptuous heavy fabrics, mirror panelled wardrobes, original artwork and contemporary chandeliers. 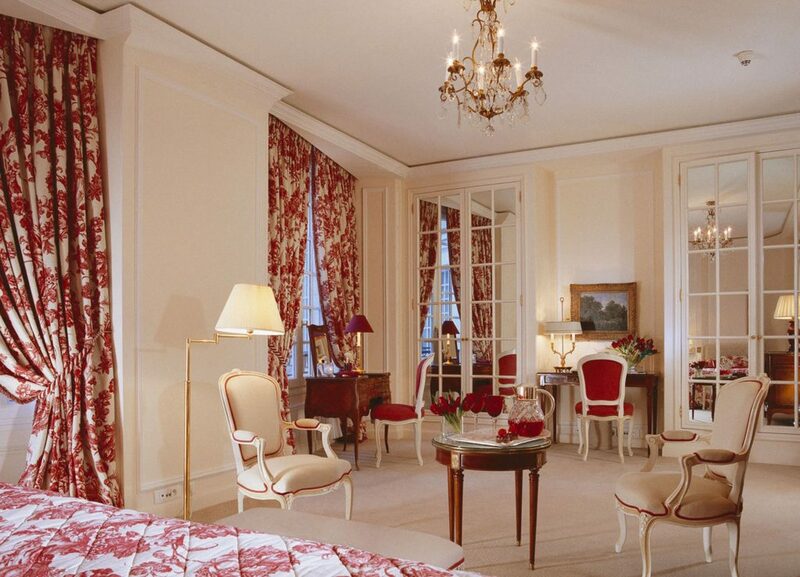 The floor to ceiling windows allowed plenty of natural daylight to cascade into the room which complimented the light shades of the furnishings and, just when you might forget you are in Paris, you could see the ‘Iron Lady’ herself from the wrought iron Juliette balcony outside. On the table in the lounge area of Rachel’s suite was a bottle of Alfred Gratien Champagne on ice, two slate dishes of handmade petit fours and chocolates and a bowl of fresh fruit as well as hand-written note welcoming us to the hotel from Didier Le Calvez, President and General Manager. As if this was not a surprise enough in each of the suites was a bag in the Le Bristol signature green with a candle from the hotel, a wonderful memory of the hotel once back in the reality of London. It would be easy to spend a lot of time relaxing and preening in the spectacular bathroom, designed entirely in white Carrara marble, it boasts a double sink with a large wrap around mirror, a very deep bathtub, a wet room and separate WC. The generous selection of bathroom amenities were by Anne Sémonin and Hermès, there were also fluffy embroidered bathrobes and slippers both embellished with the Le Bristol’s double unicorn coat of arms. However, on such a glorious day, Rachel and I had sight-seeing plans that involved a LOT of walking. After obtaining a map from front desk and gaining some strange looks when we said we intended to walk to Montmartre we set off in the afternoon sun. 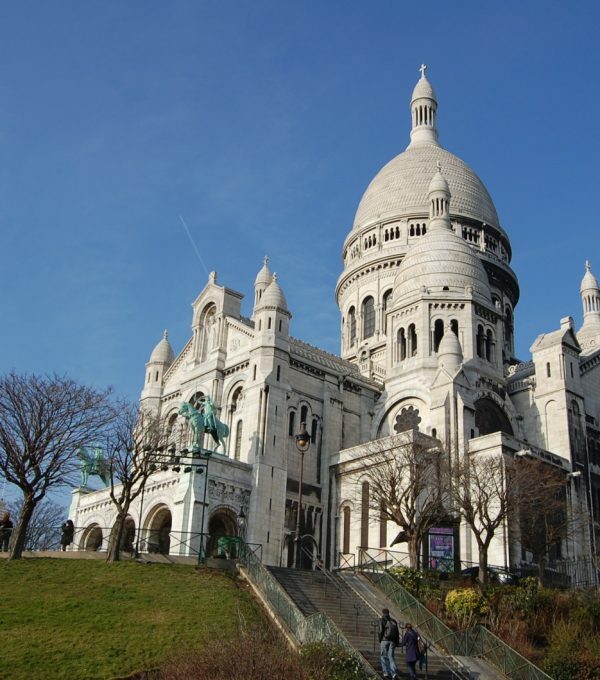 Montmartre is a hill in the north of Paris, at 130 metres high it gives its name to the surrounding district, in the 18th arrondissement, a part of the Right Bank. 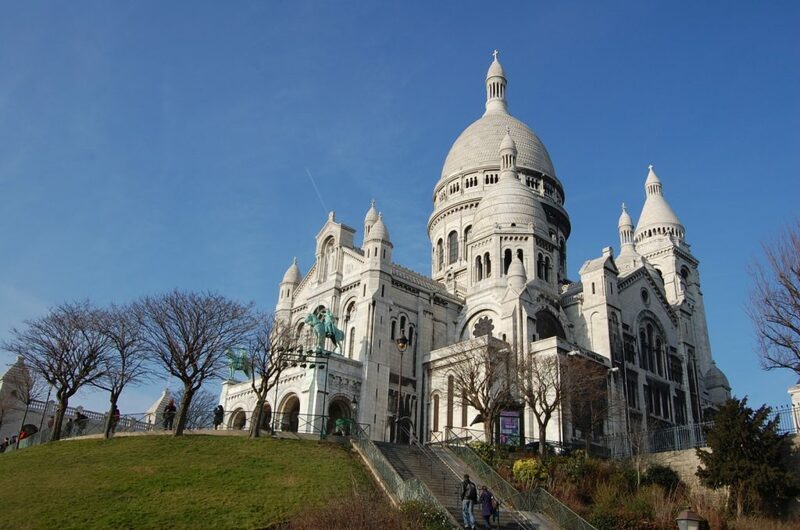 Montmartre is primarily known for the white-domed Basilica of the Sacré Cœur on its summit and as a nightclub district including the infamous Moulin Rouge and Le Chat Noir. After much huffing and puffing, and weaving through the street vendors trying to sell their wares or convince you to part with you money for magic trick, we reached the base of the grand steps up to the Basilica. Beaming like a beacon of white over the city, Rachel and I we chose to have a rest in the small gardens of Sacré Cœur to get our breath back. To get to the top there are two options, walk or use the funicular, knowing the meal that awaited us at Le Bristol that evening we braved the steps. The view from the top is truly magnificent, you can see as far as the eye can see over the cityscape of Paris and beyond, from Le Defense to the Eiffel Tower, the Montparnasse Tower to the Stade du France. After a liquid repasse we made our way back down the hill, stopping at Montmartre Cemetery to look at the gothic mausoleums and the final resting place of many a scholar, artist and socialite including Degas, Stendhal and Charles Henri Sanson executioner of Louis XVI. Once back in the hotel, feet somewhat aching from the days pursuits, it was time to prepare for dinner in the bar. Unfortunately due to the time of year Rachel and I were staying in Paris, the sumptuous Michelin restaurant Epicure and 114 Faubourg were closed but as Chef Eric Frechon, triple Michelin-starred chef, is responsible for the restaurants and bars at Le Bristol Paris we knew we were in for a wonderful evening of culinary delights. After a ‘swim’ in the bath I met Rachel in the bar, elegant and beautifully-designed with antique tapestries and master paintings, the perfect setting for what was a unforgettable evening. After dinner we sojourned to our suites, but not before drinking the gift of the champagne in the garden, highlighted by the twinkly lights in the trees. Come the morning, it was time to detox after our night of consummate retoxing, for Le Bristol is home to the Spa Le Bristol by La Prairie. Partly bathed in natural light and looking out onto an interior garden, where we had finished our evening the night before, the Pierre-Yves Rochon designed space is relaxing and calming, aided by the neutral colours and use of marble. 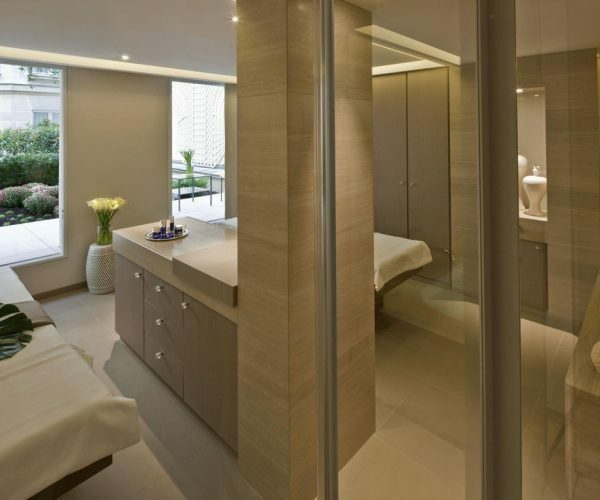 This multi-brand spa is equipped with 8 treatment rooms, including two twin rooms and a Russian room which offers a heated marble table fitted with hydrotherapy jets the first of its kind in Paris. Each treatment room has access to its own private terrace for relaxing in the fresh air to sip tea or have a quick healthy snack before or after the treatment. Also as Le Bristol only uses the best products to ensure an exceptional experience, the hotel has forged an exclusive partnership for its facial treatments with the prestigious La Prairie brand. 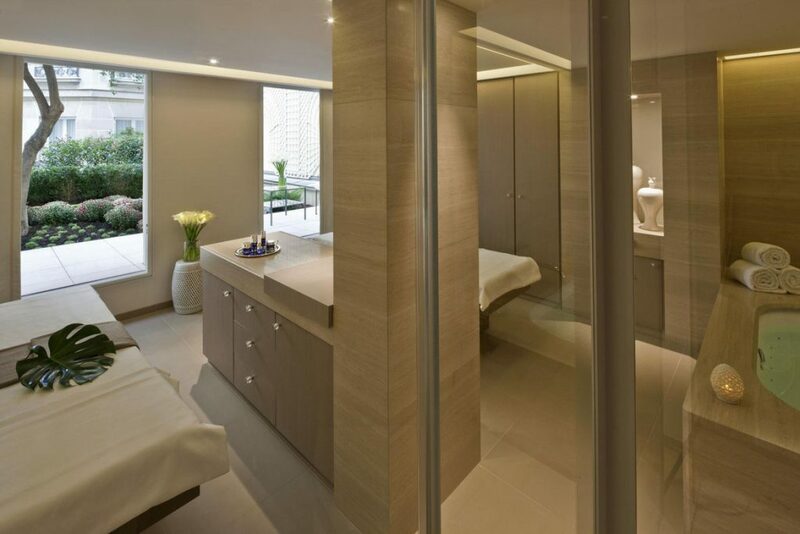 Rachel and I were there to experience the Le Bristol Signature Massage, and after being greeted at reception by Isabelle Gobbo, Spa Director, we were shown to the changing rooms to prepare for our pampering. The massage was very welcome after the previous days exploits up to Sacré Cœur, firm but mindful of the preferences of the customer and my therapist was, as with all Le Bristol staff, knowledgeable and very charming. After the spa Rachel and I made our way to the relaxing rooftop pool, shaped like the inside of a boat, with a quaint maritime mural on the wall of the interior. 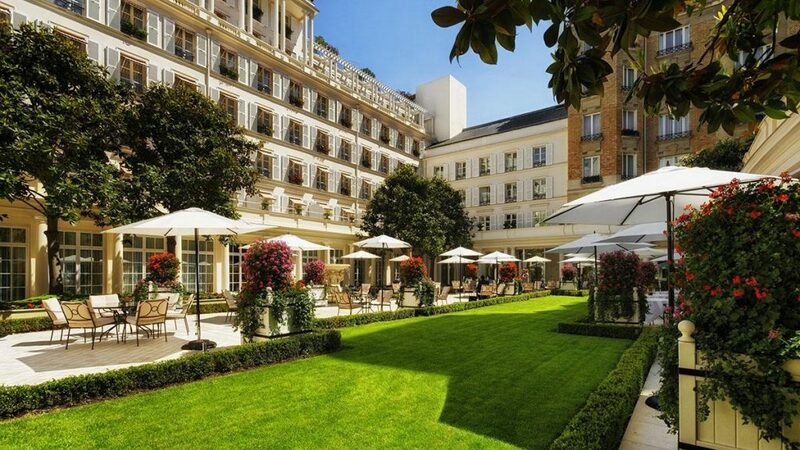 The pool area offers splendid views over the rooftops of Paris and a secluded place to bask in the sun. Sitting there, totally renewed after our spa treatments Rachel and I were come over with a great feeling of sadness, for this was our last few hours in Paris. 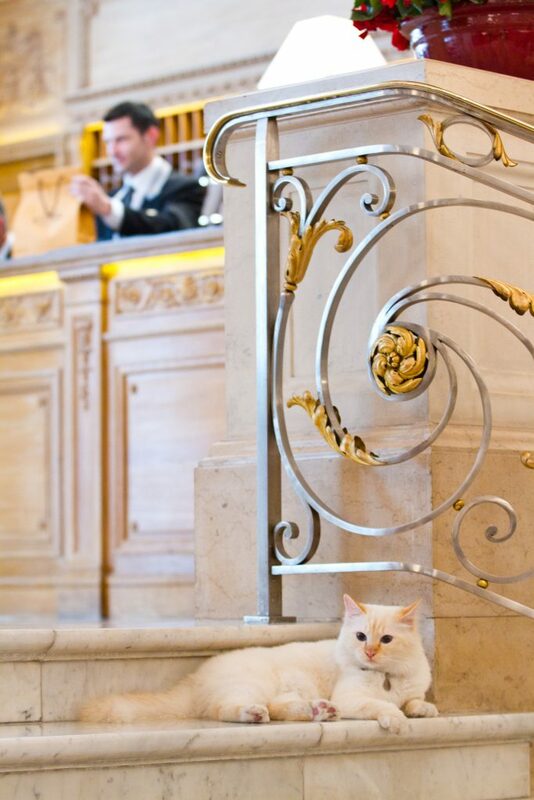 But our stay would have been incomplete without meeting Le Bristol’s majestic resident feline Fa-Raon, a fluffy Birman cat and the playmate of the guests and staff at Le Bristol. 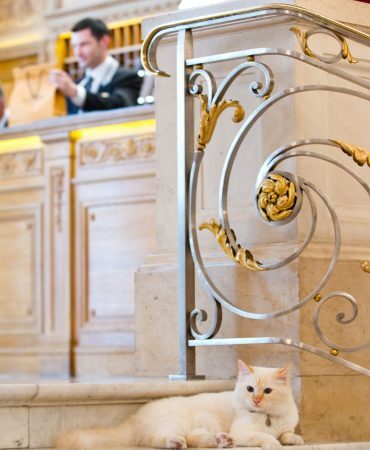 As we checked out, this unapologetic pampered and polished cat bid us farewell along with the wonderful friends we had made at this stunning hotel. 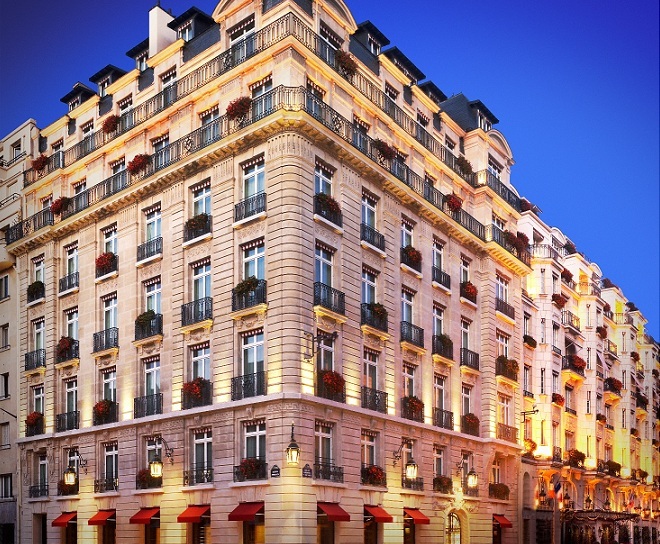 Our stay at Le Bristol Paris was truly magical and went beyond any possible expectations. The exquisite design, refined atmosphere and prestigious location charmed both Rachel and I, but it was the warm and caring staff that makes this hotel come to life, even the addition of the nonchalant Fa-Raon adds to the personal allure of this hotel. As we sped away in our Le Bristol chauffer-driven car to Gare du Nord, Rachel and I knew that whenever we returned we would be greeted with the same personal style for Le Bristol has managed to capture and express that wonderful feeling of returning home, even if that home is not usually a five star French palace hotel.